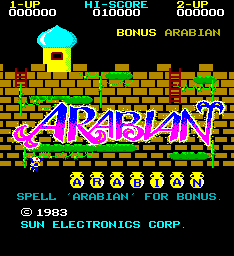 Arabian is not a very well known arcade game. It was developed by Sunsoft (who was known as Sun Electronics at the time), and licensed to Atari for distribution in the United States. Arabian was the second game that Atari licensed from Sunsoft, the first being the much more popular Kangaroo. Arabian follows in the vein of Donkey Kong presenting the player with four distinct play fields that contain ladders and moving platforms. The player's one and only goal is to collect every bag of gold scattered throughout the stage. The bags happen to have a letter painted on them which, if collected in the corrected order, will spell out "ARABIAN". The player is also awarded a bonus if he manages to collect them in just that order. Enemies come in the form of pink blobs and black crows, and your only weapon against them is your mighty kick. Enemies can be kicked into one another for bonus points. 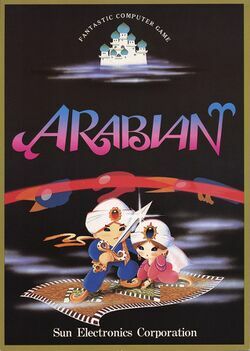 Arabian was only officially ported to one system, the Famicom where it was called Super Arabian. It was the same game, only the number of bags and the letters printed on them varied from level to level so as to spell out a variety of words instead of simply "ARABIAN". While the game was not ported to any other system, it was the inspiration for a game entitled Tales of the Arabian Nights, created by Interceptor Software, for the Commodore 64/128, Sinclair ZX Spectrum, and the Amstrad CPC. The first stage takes place on a ship just like the original game, but the stages thereafter differ. In 2001, a reproduction of the Famicom game was packaged along with Ikki in Memorial Series: Sunsoft Vol. 1 for the PlayStation. The Arabian princess has been kidnapped, and only you can save her by traversing through the four magical pages on which this story has been printed. Collect the bags of gold from a ship, a cave, a wall with magic carpets, and the outside of the castle where the princess is being held in order to rescue her. In your way are an army of pink ghosts and black crows, who will do everything in their power to stop you, even combining to form an even bigger enemy. The player must collect every bag of gold on the stage to proceed to the next stage. The player must avoid contact with the pink blobs, black crows, or any bag from which a genie is hovering. The player can jump up, to the left, or to the right by pushing the joystick in those directions. The player can kick enemies. When kicked they fly off the screen. If they hit another enemy in the process, you are awarded extra points. In order to complete certain stages, the player must jump on magic flying carpets at just the right time. If the player can rescue the princess in the fourth stage, the stages start over from the beginning with a different layout for the bags. This page was last edited on 11 February 2016, at 02:53. This page has been accessed 16,534 times.